The Copyright Amendment Bill will help creators by expanding their ability to earn from, own and create copyright protected works. Creators and public interests need these rights! Support the Copyright Amendment Bill! 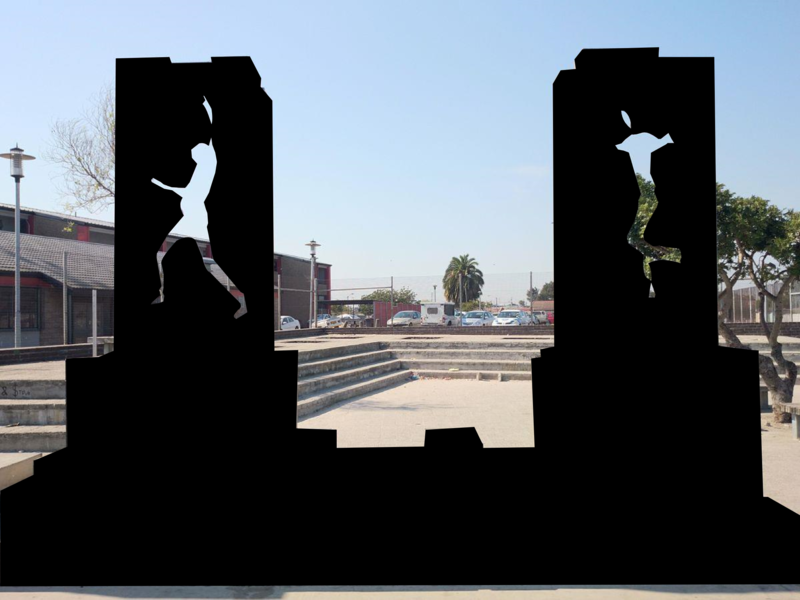 Censored version of the Two Statues of Gugulethu Seven Memorial in Gugulethu, Cape Town. Done to illustrate the importance of Freedom of Panorama in South Africa due to the ambiguous way the Copyright Act deals with media of public works of art that prevents the sharing of such material online. Find out about our organisation, mission and the results of our advocacy. Take action to support the rights of creatives. Copyright reforms to improve access to education (18 March 2019), Eve Gray and Desmond Oriakhogba. The Copyright Amendment Bill will improve publishing, not destroy it (9 March 2019), by Sean Flynn and Nontando Tusi, Business Day. 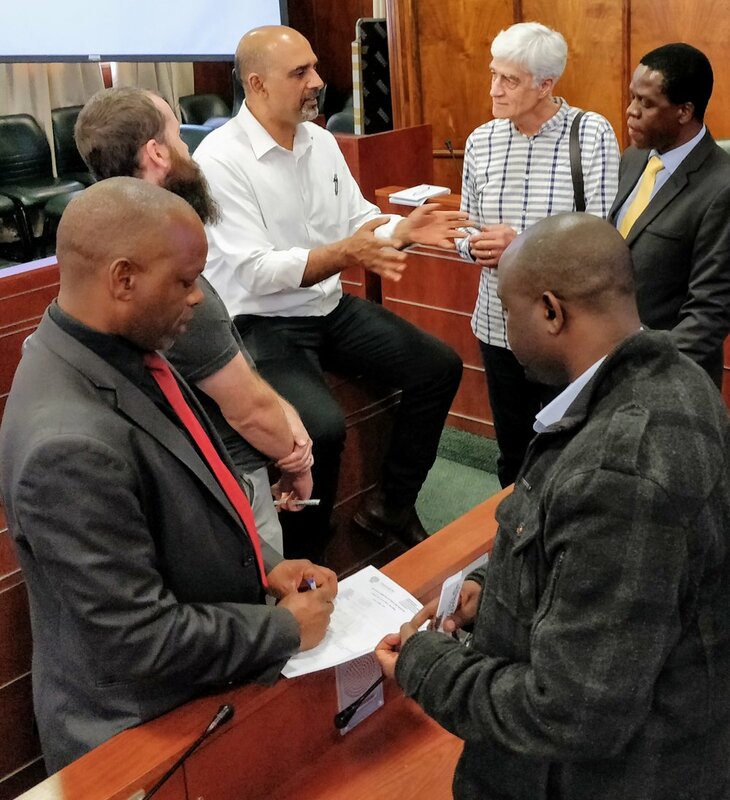 Comments on the Copyright Amendment Bill before the National Council of Provinces; Promoting Technological Adaptability and Education (22 February 2019), by Dr. Andrew Rens, Internet Governance Lab, American University, Washington DC. For a full updated on South African copyright related news please see Denise Nicholson’s free online international Information Service, COPYRIGHT & A2K ISSUES, for the 8 March 2019. The Bill creates modern exceptions to copyright, including a balanced “fair use” right, that permit digital and other uses necessary to make original work and to exercise our freedom of expression. The Bill removes the Apartheid-era standard that made the commissioner of many works the default owner of our art. The Bill improves the regulation of contracts and collective management organisations to ensure we are paid for our work and protected against abuse and exploitation. The Copyright Amendment Bill is a step in the right direction in that it brings South African legislation in line with its international treaty obligations. The hybrid system improves on the fair dealing system by introducing a fair use principle. Fair use provides a list of four criteria which will provide better access to information. The exceptions for uses such as research, education, libraries, archives, format shifting and for people living with disabilities are welcomed.These amendments are long overdue and provide the necessary clarity in our copyright law. ReCreate further welcomes the support of creators, teachers’ unions, educators, authors, and student activists who look forward to the implementation of the fair use system and access to knowledge and information. Download a copy of this statement here. Today's vote in the House on the Copyright Amendment bill. From 48:10 to 1:55:36 is the first vote on the Bill. There after until 2:58:44 they are voting on the Performers Protection Bill until the second vote on the Copyright Amendment Bill again from 2:58:44 to 3:07:55. The Copyright Amendment Bill passed on the second vote with no abstentions, 197 “yes” votes and 4 “no” votes. The next step for the bill is to appear before the National Council of Provinces for concurrence. Voting patters of each party on the Copyright Amendment bill. Published by ReCreate in response to Prof Sadulla Karjiker’s article published on the 19th October 2018. "South Africa’s 40-year-old Copyright Act is heading for a long-awaited amendment, and just about everyone disagrees on the way forward"
Competition Commission investigating book publishing 'cartel' over price-fixing claims (29 August 2018) - Fin24. "Competition Commissioner Tembinkosi Bonakele has initiated an investigation against the Publishers' Association of South Africa (PASA) and its members for allegedly fixing the prices of books." Gospel shocker: How black musicians got screwed (1 April 2018) - CityPress. "Copyright lawyer’s investigation blows lid on alleged 55-year-old royalty payout scam." Copyright Amendment Bill: two-phase proposal; "Debt Intervention" National Credit Amendment Bill: new draft (8 May 2018) - Parliamentary Monitoring Group. Response to IIPA Comments to USTR Regarding South Africa's Copyright Amendements Bill and AGOA Eligibility (24 August 2018) - InfoJustice. "Submission to U.S. Trade Representative for the Annual Review of Country Eligibility for Benefits Under African Growth and Opportunity Act [Docket USTR-2018-0022]"
ReCreate SA calls for creator rights in copyright reform now (23 May 2018) - Mail & Guardian, by ReCreate. "As creators, we are users of existing cultural products. Currently our work can be blocked through censorship by copyright owners for uses that would be freely permitted elsewhere. Moreover we often do not not own the work we create. And many of us have been disadvantaged by an exploitative system which fails to pay us for our work." New Organization Formed In South Africa To Promote The Rights Of Creators And Support Intelligent Copyright Reform (29 May 2018) - TechDirt.